We'll be back from the Easter holiday break Wednesday, March 26 soon. I'm deeply envious of all of you in the New York area right now, because you can go to Lori Field's new exhibition and I'm going to miss it! Damn. Lori is an absolutely amazing collage artist who lives and works in Montclair, New Jersey. Her new show is on display until April 26th at the Kinz, Tillou and Feigen Gallery at 529 W. 20th Street in Manhattan, running alongside an exhibition of drawings (the "Rappaccini's Daughter" series) by Megan Greene. "Both artists," the curators note, "share an affinity for incorporating imagined and enigmatic subject matter in their fantastical work. 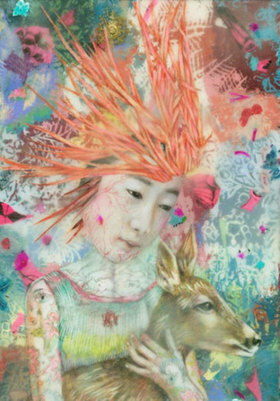 "Lori Field's encaustic paintings with collaged drawings portray hallucinatory visions derived from her flirtation with demonic realms, personal fairy tales, and the human world. The chimerical creatures that populate Field's mixed media works are at once familiar and mysterious. They are the realization of modern day myths that draw on a primitive lore. Her fanciful visual and cultural vocabulary is embellished with elements such as thread, lace, and insect wings - a mélange that inspires discovery and wonderment." For more information on the Field and Greene exhibitions, visit the Kinz, Tillou and Feigen Gallery website. 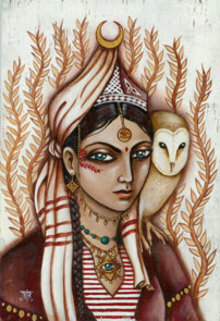 To see more of Lori's gorgeous, dreamlike imagery, visit the Lori Field Fine Art website. Viktor Vasnetsov (1848-1926) was a Russian painter of historical, religious, and folkloric subjects. He trained at the Imperial Academy of Arts in St. Petersburg, and then reacted against the art establishment there by joining the Peredvizhniki, the Itinerants movement. 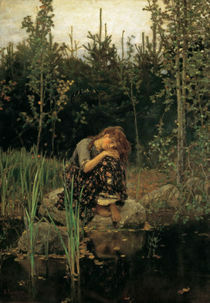 Much like the Pre-Raphaelite Brotherhood in England, the Itinerants refused to confine themselves to painting polite and acceptable subjects, scandalizing 19th century audiences by depicting scenes of Russian peasant life -- much as the PRB shocked Victorian society with paintings of prostitutes and other déclassé subjects. Both the Itinerants and the early Pre-Raphaelites rebelled against the formal academy method of painting, with its adherence to rigid rules of design and a light-on-dark color palette. This younger generation of artists championed naturalism, sunlight, and a color palette that seemed shockingly bright, even garish, by the standards of the day. And both groups were influenced by the new movement for folklore scholarship that was sweeping the globe, finding inspiration in the peasant folk art traditions of their respective countries. The Itinerants were more overtly political, however, laying the groundwork for the subsequent Social Realist movement...although the PRB had their political side too, particularly in William Morris's passionate pairing of art and socialism. 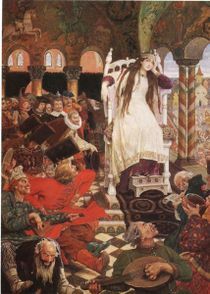 Vasnetsov made his obligatory pilgrimage to Paris in 1876 -- and it was there that he began painting the fairy tale subjects that became his obsession. 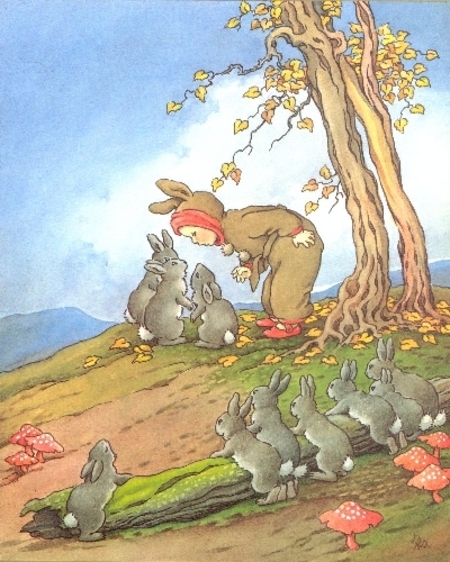 Returning to Russia, he continued to explore the themes of Russian folk tales and bylinas (heroic epic poems of the Slav tradition) -- and was considered by some to have betrayed the Itinerants cause with such frivolous subjects. It was one thing to ennoble peasant life (and thus champion social democracy) by referencing folk art colors and design, and quite another for a serious painter to devote his time to old wives' tales. Vasnetsov had grown up among peasants, however. He came from a highly educated family, but his father had been a priest in a small, remote village during Viktor's childhood -- thus he'd grown up hearing fairy tales from the old country storytellers, and he understood them as metaphor, as the ancient language of rural life. 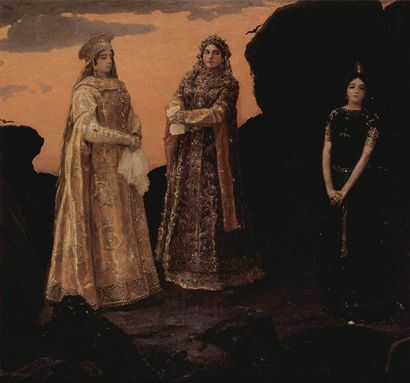 In his later years, Vasnetsov concentrated more and more on theater and building design -- but even in these fields he remained true to his love of fairy tales, creating magical sets for operas and plays and championing a "fairy tale style" of Russian Revivalist architecture. If you're heading to Moscow anytime soon, then be sure to visit the Vasnetsov "house-museum" on the Pereulok Vasnetsova. 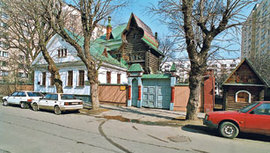 As a recent article in the Moscow News reports: "The Dom Muzei VM Vasnetsov was built by the artist in 1894 and houses some beautiful wooden furniture and tiled stoves downstairs as well as several of Vasnetsov's paintings of fairy tale characters like Sleeping Beauty and Baba Yaga in the studio upstairs. Unlike many house-museums, where the furniture has been brought in to approximate the requisite era, every thing here is original and you can sit on nineteenth century benches to admire the huge canvases in the wooden attic. Vasnetsov's pictures here are at least as good as the ones in the Tretyakov Gallery, whose facade he designed. 'A true work of art,' he believed, expresses everything about a people. 'It conveys the past, the present and perhaps the future.' "
For more information on Viktor Vasnetsov, visit the Russian Avant-Garde Gallery website. And for information on Russia's rich fairy tale tradition, read Helen Pilinovsky's "Russian Fairy Tales, Part I: The Fantastic Traditions of the East and West" and "Part II, Baba Yaga's Domain," and James Graham's "Baba Yaga in Film," in the JoMA archives. 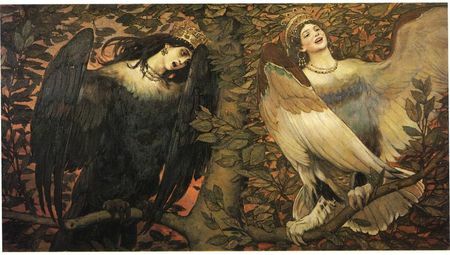 The Vasnetsov paintings above are: The Birds of Joy and Sorrow, Alyonushka, and The Tsarina Who Would Not Smile. Below: The Three Queens of the Underground Kingdom. Táin Bó Cúailnge, better known as the Táin, and customarily translated as The Cattle Raid of Cooley, is the most important of the approximately eighty tales that make up the Ulster Cycle. Queen Medb of Connacht, equal to her husband Ailill in all things except for the possession of a prize bull, goes to Ulster to steal the Donn Cúailnge, the Brown Bull of Cooley, to balance the scales. The men of Ulster being laid low by the periodic curse that has come upon them, the eighteen-year-old Cú Chulainn defends the province against the army of Ireland. 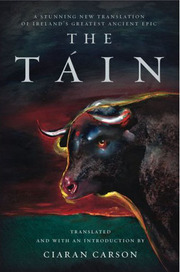 It is an epic tale, full of violence, treachery, daring, and feats of arms, and Ciaran Carson's new translation, The Táin, is equal to it. Legend has it that the Táin was first written down in the seventh century, when St. Colm Cille summoned the soul of Fergus Mac Róich, one of the main protagonists of the story, from the grave. Fergus recites the entirety of the Táin to St. Ciaran of Cluain, who writes it down on the hide of his pet dun cow, thus giving the name of the manuscript, Lebor na hUidre, "The Book of the Dun Cow." 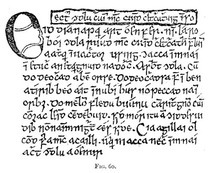 As "The Book of the Dun Cow" is one of the extant manuscripts in which a partial version of the Táin is found, it is fitting that this excellent modern version is also scribed by a Ciaran. Carson's translation is fresh and powerful, successfully negotiating the variety of literary styles present in the Táin. He gives as much respect to the high poetic elements of the roscada, the shadowy episodes of verbal jousting engaged in at key points of the story, as he does to Cú Chulainn's truly astounding feats of military prowess. Above all, Carson maintains the essential Irish flavor of the story. When you finish, you know that "what you saw was a people coming together." The Táin and the Ulster Cycle have inspired a number of exciting artistic projects. 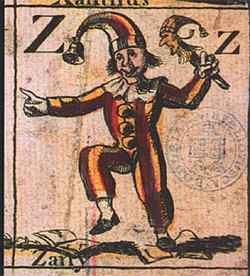 The Decemberists recorded a version in song, and Gregory Frost has written novelizations both of the Táin, and of some of the other Ulster Cycle tales in Remscela. And perhaps my favorite new version is that by Belfast writer and cartoonist Patrick Brown, who is currently creating the Ulster Cycle as a webcomic, a terrific blend of the Iron Age and the modern. His ebook translations of some of the stories are also available on his site, and I highly recommend them. In honor of St. Patrick's Day, our Monday Video comes from one of my very favorite Irish bands, The Saw Doctors, performing an accoustic version of their song "N17" at Nighthawks in Dublin. 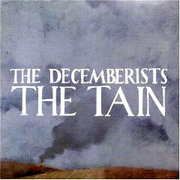 (The band's name comes from itinerant craftsmen who once traveled from sawmill to sawmill sharpening and repairing saws. And the N17, for those unfamiliar with Ireland, is a road that runs from County Sligo to County Galway.) For more information about the Saw Doctors, and a list of their CDs, visit their website. "N17" comes from an early CD, If This is Rock and Roll I Want My Old Job Back, which is terrific -- but all of their CDs are fabulous and I'd be hard put to recommend one over another. If your taste in Irish music runs more towards the traditional, follow this link to a video of the American-Irish band Solas performing "Coconut Dog/Morning Dew," with some truly lovely fiddle and guitar playing. And then for something different again, here's "Tóg é go bog é," a Gaelic song sung to the beat of bodhrán and djembe drums, from the Dublin folk-fusion band Kíla. For more information on these bands, visit the Solas and Kíla websites. Our Sunday Poem today is "How to Change a Frog Into a Prince" by Anna Denise, from the Poetry 180 website. Anna Denise was born in Livermore, California, and now lives in Davis. She received her MLS from San Jose State and currently works as a children's librarian. 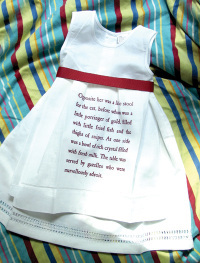 She is also a storyteller and is at work on a collection of fairy-tales poems. 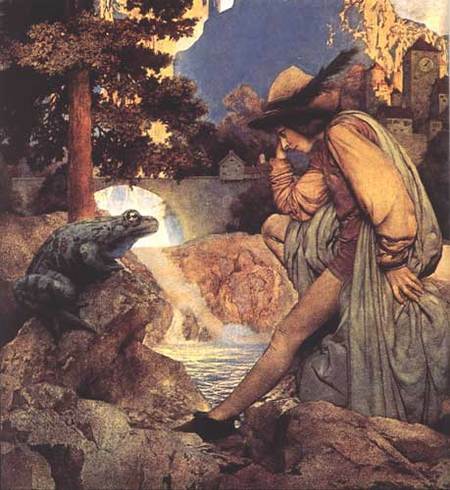 The painting above is "The Frog Prince" by Maxfield Parrish. The charming paintings above are by Nadia Turner, a freelance illustrator out of Melbourne, Australia. 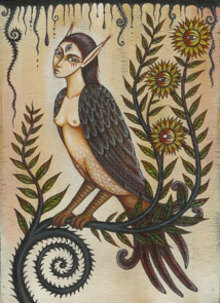 Her inspiration, she says, comes from many sources: the art of the Surrealists and the Pre-Raphaelites, traditional folk art, children's book illustration, and music -- especially the Celtic harp and all the mythology and folklore associated with it. 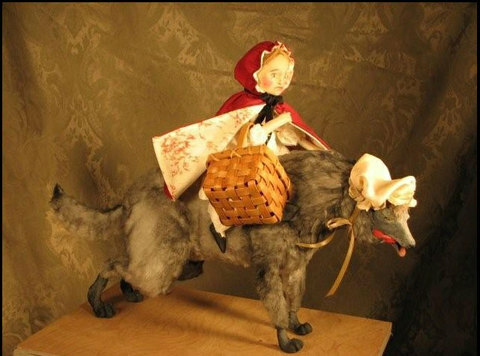 Stop by doll maker Jo James' wonderful blog The Cart Before the Horse, and have a look at the terrific collection of Little Red Riding Hood Dolls produced by "Coffee With Tea," a collective of women artists. Sadly, some of them have already sold on ebay, or are not for sale -- but they sure are charming. 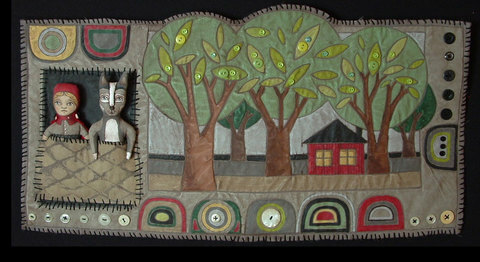 The one pictured above is a quilted piece by Jo James, and both the figures of Little Red Riding Hood and the Wolf are removable. You can see more on the process of making the piece here.The doll below is by Nina Mason, and stands about 15 inches high. Little Red Riding Hood carries a vintage basket and can also be removed and reposed. The wolf, about 21 inches long, is covered in fur that has been dipped in paint to give it more texture. You can see more closeup photos of the pair here. Remember those lovely fairy tale beds we were drooling over recently? (They were here and here.) 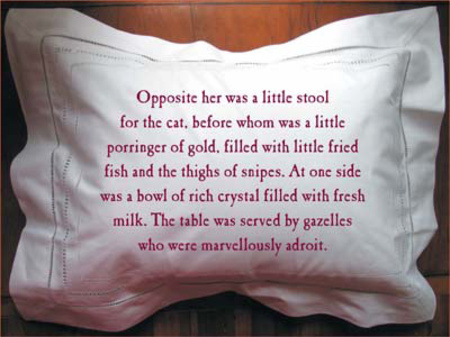 Well, I've just stumbled across the perfect linens for them: The Curious World of Fairy Tales Boudoir Pillows from Atelier Dageurre. Atelier Daguerre is a housewares company featuring the work of Candyhog (a.k.a. the designers Abigail Hamilton and Richard L. Thompson). The company is located on Bainbridge Island, off the coast of Washington state. Check out the Atelier Daguerre website, which is filled with delights -- including the cunning little fairy tale dress on the right.